This Major League match-up offers a rivalry that predates both teams' involvement in MLS. Due to the close proximity of the cities, these cross-border neighbors put a big emphasis on the "derby" each year. The support during these matches also tends to be on a much higher level than the usual family-event quietness of other games. If you've never watched an MLS match before, this may be the one for smooth transition, with footballer previously well-known in Europe playing on both squads. 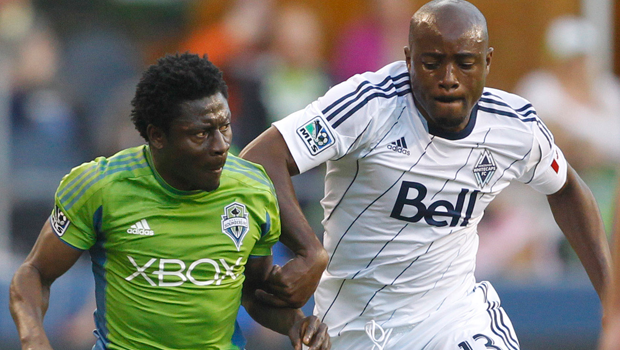 Obafemi Martins and Djimi Traoré will most likely start for Seattle, while Vancouver (managed by former Wolverhampton and Welsh national footballer Carl Robinson) will field the like of Nigel Reo-Coker and former Watford player Jay DeMerit. The Toulon Tournament is a showcase of footballers in the U20 age-group. Featuring players such as Loïc Rémy, Jeremain Lens, Keisuke Honda, Tim Krul and Hull City's Yannick Sagbo in the past, this Brazil - England match could be a nice fix of international footy leading up to the Fifa World Cup in June. Brazil's line-up features the likes of Paris Saint-German defender Marquinhos and Vasco de Gama talented young striker Thalles. England will counter with Jack Butland in goal (who was already capped once for the English senior squad), the talented Leicester defender Liam Moore and young West Brom striker Saido Berahino. Two of the most popular clubs in Brazil and early league leaders are going head-to-head this Sunday, and is a great chance to catch some good quality South American football and preview the Beira-Rio stadium in Porto Alegre which will host 4 group stage and a Round of 16 match this summer during the World Cup. With promotion on the line, QPR will be looking to get their insane wage-bill squad back to the Premier League just a year after their relegation, while Derby will be looking to come back to the first tier after a 6 year hiatus. Like many promotion finals of the past, this one promises to be a very entertaining one, with Derby's talented youngsters going up against QPR's "star-studded" line-up. With the Champions League Finals going this Saturday, it's hard to even consider the first 4 matches on our list. This meeting between Madrid rivals Atletico and Real is so big that the television networks are predicting an all time high in ratings for this event. There are many reasons why this match is not only the top match this weekend, but the biggest this month, and one of the more enticing this year (yes, even with the World Cup coming up). Ronaldo, Bale and Ramos vs. Costa (if healthy), Turan and Koke. Need more? ok! Also, this will be the first time that the Champions League Final is contested between two teams from the same city. And if the first two didn't get you going, all I have to say is this: There are 2 kinds of football fans in this world, the ones that love Real Madrid, and the ones that hate them, so either way everyone will be glued to their telly this Saturday to watch this epic match.